If you work in an office, then there is a good chance that you use your mouse for around six to seven hours a day. The result of this, of course, is that your hand and wrist undergoes quite a bit of stress each. The good news is that this strain can easily be remedied with the help of an ergonomic mouse. 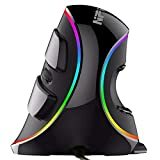 Of course, if you aren’t too sure about how to select the best ergonomic mouse, you may find that there are quite a few brands and models to choose from. To cut down on the work that you need to do, we have decided to compile a list of the top options on the market. Below, you will find our favorite picks as well as a buyer’s guide that will help you simplify your selection process even further. One of the easiest ways to reduce the strain on your hands and wrist is to ensure that it is kept in a more natural position. Well, this is exactly what this wireless mouse does for you. The design of the device ensures that your hand is continuously kept in a “handshake” position. The 57-degree angle allows your forearm to rest more naturally and to cut down on any twisting. As a result, there is much less muscle strain. To add to this, the premium scroll wheel, textured thumb area, and natural grip all make this a comfortable mouse to use. Of course, it isn’t just the style of this device that makes it stand out. The features are incredibly effective as well. To start with, the 4000 DPI high-precision sensor allows for top-notch tracking, reducing how much you need to move your hand while using the mouse. The only real downside is that it can be difficult to scroll quickly down a document or page with this mouse. On the other hand, the battery life is excellent and can last up to four months when fully charged. 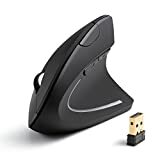 Last but not least, you can connect this mouse to your device in three different ways – via Bluetooth, a Logitech Unifying Receiver, or a USB-C cable. This vertical wired mouse allows your hand to be more relaxed while using it. This is achieved by the unique design of the mouse. Therefore, your wrist can be kept in a more natural position while simultaneously improving the support for your forearm. There is also a detachable palm rest. By using this, you can reduce the drag experienced across your desk or another surface. Overall, though, the mouse has been set up to be much easier for the average person to use. This can be seen with the positioning of the left/right buttons and the scroll wheel. The only unfortunate thing is that the back/forward buttons aren’t placed so well and as such, it is quite easy to hit them by accident. The good news, however, is that the scroll function can be customized with the help of the DPI button. Thus, you can select between 600, 1000, and 1600 DPI, depending on your preferences. Also, the high-resolution optical sensor means that you can expect excellent responsiveness, making the mouse a lot smoother to work. Last but certainly not least, this is an incredibly durable device and is guaranteed to last you quite a while. There is no denying that there are many ergonomic mice that can take some getting used to. This, however, isn’t an issue with this wireless device. While it does keep your hand propped up in a more natural, “handshake” position, it does so without altering your preferred stance too much. Therefore, it will take you less time to get used to how this mouse should be worked. The other perk, of course, is that this mouse is specifically meant for those with small hands. Of course, this does mean that those with medium to large hands will struggle to use it. 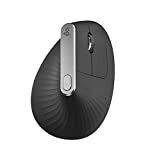 To add to this, the ergonomic design of the mouse ensures that your palm is supported better and that you are less likely to endure wrist strain. This is certainly a responsive mouse to use as well, thanks to the high-resolution optical tracking feature. Furthermore, you also have control over the DPI and can select from 800, 1200, and 1600 DPI. The mouse is simple to set up as it relies on plug and play technology. The 2.4G USB receiver also allows you to quickly and efficiently pair up with most devices. It is compatible with numerous operating systems including Windows, Linux, and Apple to a certain extent. If you are someone who uses a mouse all day long, you know that strain isn’t the only concern. Your hand can also begin to feel rather tired as well. Fortunately, this mouse’s design remedies such a problem. The vertical design is accompanied by special rests for your thumbs. The grips of the mouse also adhere to the natural contours of your hand, allowing it to rest more easily. If you do require more support, there is a detachable palm rest that you can use as well to reduce the overall strain on your hand. It should also be noted that this is a great mouse for gaming since there are five adjustable DPI levels. You can select from 800 all the way up to 4000 DPI. To add to this, there are seven programmable buttons, allowing you to quickly customize the buttons to your requirements. The memory function means that these settings will be saved for future use as well. The only issue with this mouse is that the scroll wheel can be slippery at times, making it a tad bit difficult to use. This device also has a high compatibility with a number of different operating systems. These include Windows and Mac OS. If you are looking for a more subtle, sleeker ergonomic mouse, this is the device for you. However, it is more than just a stylish mouse. This has also been designed to be as ergonomic as possible. For one thing, it encourages your hand into a more organic, “handshake” position while using the mouse. As such, there is no pressure on your wrist joint, meaning that there is no risk of discomfort or cramping. At the same time, you will find that there are plenty of other features that make this a great mouse to work with. For instance, the buttons and scroll wheel are perfectly located, making it a breeze to work with them, even when in a hurry. It should be noted, though, that the click buttons can get stuck from time to time. The optical tracking function ensures that your overall user experience will be quite smooth and responsive. To add to this, you can also easily customize your DPI settings and select from either 800, 1200, and 1600 DPI, depending on your preference. The 2.4G USB receiver allows you to quickly and easily sync up your preferred device. It also has a power saving mode that allows you to extend the life of your batteries to boot. Now, it is time to move onto the buyer’s manual portion of this guide. Here you will find all the information and tips to make the best decision. 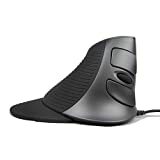 Vertical Ergonomic Mouse: most ergonomic mice you will come across do boast a vertical design. That’s because these devices keep your arm in a more natural position. As such, you are less likely to feel any discomfort or have other issues related to strains. However, many people take a while to get used to this kind of mouse as it is quite different from what you are familiar with. Therefore, your productivity may suffer for a short while. Horizontal Ergonomic Mouse: these aren’t quite as popular as the vertical option. This is largely because they don’t offer nearly as much support, although they are certainly more ergonomic than the traditional versions. With these mice, you are allowed to keep your hand in a typical, horizontal position, making these devices easier to use. They are designed, though, to offer more palm and wrist support to alleviate some tension and discomfort. In this section, we will discuss some of the features you should focus on when looking for an ergonomic mouse. The whole point of an ergonomic mouse is that it gets your hand and arm into a more neutral position. Therefore, when you have to keep your arm in this position for an extended period of time, you won’t suffer any side effects. Now, the “handshake” position has been mentioned quite a few times here. So, let’s dive into what it actually means and why you should look for this feature on your ergonomic mouse. As the name suggests, the handshake position positions your hand and your arm like you are shaking the hand of someone else. When it is in this position, your arm is in a relaxed, neutral position. This is quite unlike the twisted position required with traditional, horizontal mice. 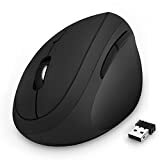 The next decision that you will need to make is regarding whether to get a wired or a wireless mouse. Once, this wouldn’t have been difficult as the older wireless mice tended to have a bit of a lag. These days, though, the difference is negligible. One of the reasons people prefer wired mice is that they are more affordable and hassle-free. Since they remain plugged in you don’t have to worry about charging them or replacing batteries. That doesn’t mean that the wireless versions aren’t without merit, however. One of the biggest benefits of these mice is that they give you more space to move around. You can often be quite far away from your computer and still have these devices work. In the end, it does come down to personal preference. As you will realize, due to the design of ergonomic mice, the buttons and the scroll feature will have changed position rather drastically. Not to mention, most ergonomic mice come equipped with other buttons and functions as well. It is because of this that you always need to determine the positioning of these buttons. How comfortable they are to use, for instance? You need to make sure that you don’t accidentally press any of the buttons while using the mouse as well. It is probably a good idea to look for an ergonomic mouse that allows you to select a DPI speed that is right for you. This way, you can change the speed according to the tasks you are trying to complete at that moment. Having this feature makes your ergonomic mouse just a little more comfortable for you to use. Size: most people don’t think to consider the size of a mouse, but it is important, nevertheless. See, there are some mice that are meant for smaller or larger hands. So, for a perfect fit, the mouse needs to suit the size of your hand. Aesthetic Appeal: if you are working in a professional environment then the design of your mouse does matter. Thus, you should look for one that boasts a sleeker design and that is available in neutral colors. Durability: if you tend to use your mouse quite often, look out for one that can withstand consistent use. This way, it will last longer and be less likely to break down. Compatibility: first consider your operating system before purchasing a mouse. Then, when selecting the mouse make sure it is compatible with the OS on your digital device. To sum things up, you will need an ergonomic mouse that has a comfortable and natural design and that is responsive as well as hardwearing. If you want a mouse that won’t take much getting used to, opt for the Jelly Comb as it has a low learning curve. For those working in a more professional environment, the Anker mouse will prove to be a sleek and subtle accessory. On the other hand, if you don’t mind making a colorful impact, you should go with the NPET mouse. If you are looking for optimal support and a greater number of features, the Logitech and J-Tech mice will be your best options. This guide should tell you everything you need to know regarding ergonomic mice. As such, you should have no trouble at all finding one that is most suitable for you.